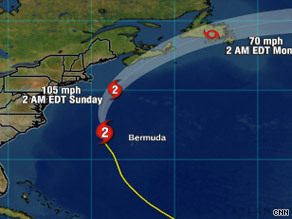 Hurricane Bill skipped Bermuda and set its sights on the Massachusetts coast Saturday morning, with forecasters warning people from New England to Newfoundland to be on alert. The storm is expected to pass off the coast of New England late Saturday or Saturday night and approach Nova Scotia on Sunday, the National Hurricane Center said. The Bermuda Weather Service discontinued a hurricane watch early Saturday. A tropical storm warning remained in effect, and the weather service warned that strong winds, high seas, and dangerous surf and rip currents would continue through the day. Rip currents, or rip tides, are strong seaward flows of water that happen where there’s a break in the shoreline. They are capable of pulling even strong swimmers out to sea, and they are difficult to detect. The storm was expected to bring one to two inches of rain to Bermuda, the U.S. National Hurricane Center said. At 8 a.m., Bill’s center was about 235 miles west-northwest of Bermuda and about 410 miles east of Cape Hatteras, North Carolina. It was also about 510 miles south of Nantucket, the hurricane center said. The storm will have some fluctuations in intensity, forecasters said, and should weaken Saturday night and Sunday as the center of the hurricane moves north of the Gulf stream. Hurricane-force winds extend outward up to 85 miles from the storm’s center, and tropical storm-force winds extend outward up to 275 miles. Bermuda was still reporting sustained winds of about 40 mph (64 kph). On Friday, the National Weather Service issued a high surf advisory for Virginia Beach, Virginia, and warned of a high risk of rip currents. Watch CNN’s Bonnie Schneider talk about rip currents » The Virginia Beach Emergency Medical Services Department ordered red flags be flown to warn beach-goers of rough waters. And the Virginia Beach Lifesaving Service closed the oceanfront for the weekend, according to CNN affiliate WAVY-TV 10. Still, some people still were out enjoying the water, albeit with caution. “I think [the flying of red flags] means we should be paying attention,” Erma Wicks told CNN affiliate WAVY. There is an alert in the water. But there’s no problem; I’m not going in that far.” Farther north, the Rhode Island Emergency Management Agency began making preparations ahead of the rough surf that was expected to hit this weekend. RIEMA said on its Web site that it planned to staff its lifeguards at “monitoring” level this weekend. “We have to plan for the worst and hope for the best in this situation,” RIEMA Director J. David Smith told CNN affiliate WPRI. In New York, all beaches facing the Atlantic Ocean were closed “due to heavy, high waves and particularly heavy currents,” New York City Parks and Recreation Commissioner Adrian Benepe said. “The lifeguards have a lot of experience with these ocean beaches and they just felt it was really too difficult to keep swimmers out of danger,” Benepe said. “We’re seeing very strong currents and increased wave height, waves of six to eight feet at Rockaway Beach. The normal out there is usually no more than two or three feet,” he said.